Located an hours' drive from Queenstown on the peaceful surrounds of Lake Wanaka is Distinction Wanaka Serviced Apartments. This luxurious self-contained accommodation is the perfect base for your next New Zealand family adventure, whether it be for the snowfields or the lake, rivers and national park. Edgewater enjoys a unique location on the banks of the Mersey River near its entrance to Bass Strait. Each morning 'Spirit of Tasmania' glides gently into the river and berths adjacent to Edgewater. A range of comfortable air-conditioned courtyard rooms offer excellent value for money. Waterfront rooms are also tastefully furnished and enjoy a frontage to the Mersey River. Located just minutes from Lake Wanaka, New Zealand’s fourth largest lake, Oakridge Resort Lake Wanaka offers a relaxing range of accommodation surrounded by spectacular landscapes. The idea base for outdoor activities and exploring, the resort offers bushwalking, mountain climbing, jet skiing, kayaking and wind surfing and in winter, there are three ski fields within minutes of the resort inclulding Treble Cone and Cardrona. Set just 10 minutes walk from the waters edge in Lake Wanaka, Ramada Resort by Wyndham Wanaka boasts a selection of studio, 1 and 2 bedroom apartments which feature kitchenette facilities & access to shared laundry facilities. 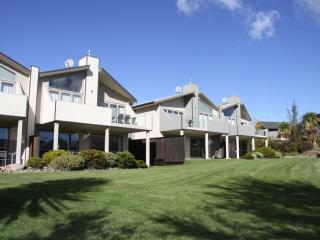 This Wanaka accommodation also offers a heated swimming pool with slide, sauna, hot tub, BBQ area and WiFi Internet. Ramada Resort by Wyndham Wanaka is perfect for a weekend escape or extended family holiday with easy access to nearby attractions, restaurants & entertainment.